Please join us on Saturday November 10th, at Zorba’s – 1474 Bath Road for an evening of great music and great dancing. 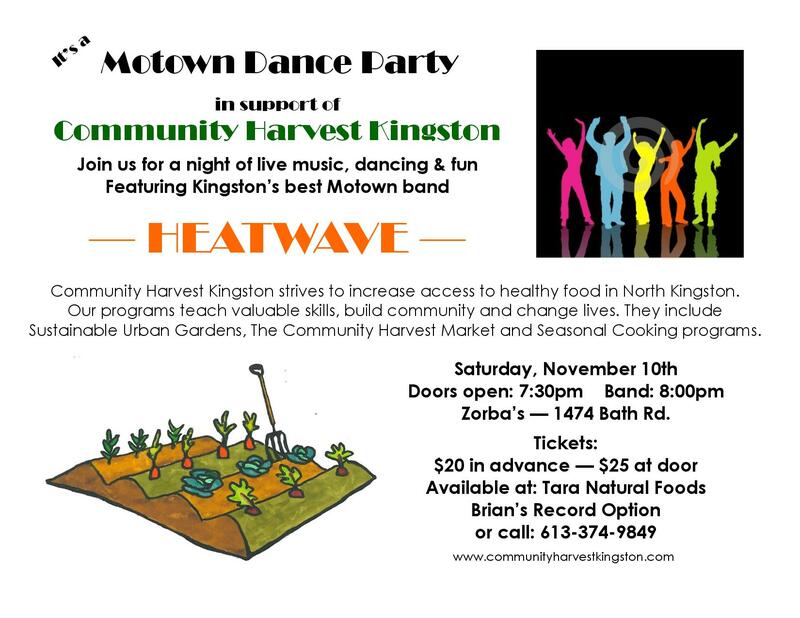 Featuring HEATWAVE, Kingston’s best Motown Dance band. Tickets are $20 each and are available from me or at the door. Come out and support the gardens, meet friends, and have a wonderful evening. Check out our website at http://www.communityharvestkingston to find out more. We now run 3 gardens in North Kingston, these gardens engage the community, teach valuable skills, and provide food for donation to food security organizations as well as for sale at our Community Harvest Market at the Wally Elmer Recreational Centre. p..s – if you would like to volunteer to help with the dance or to sell tickets, please let me know.